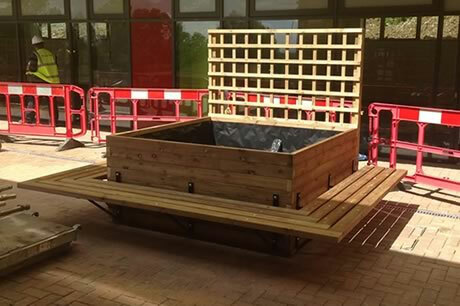 Here at Taylor Made Planters we can make wooden garden planters to any size, most shapes and out of hardwoods or softwoods, and any colour required. 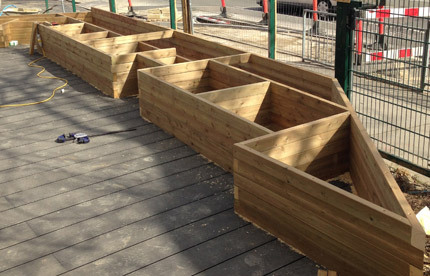 All of our bespoke wooden planters are hand crafted by highly skilled craftsmen and delivered by ourselves. 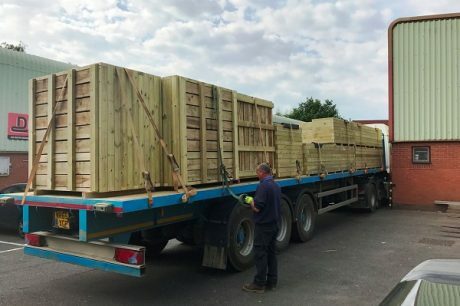 Taylor Made Planters rely on customer satisfaction so only the highest quality materials are used to create a unique personalised product catering to all the customers’ needs. 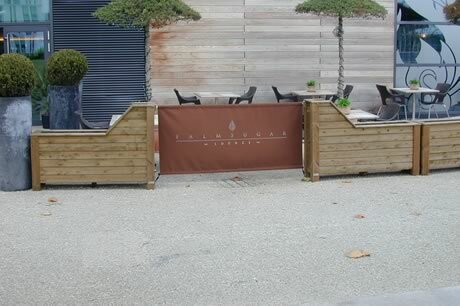 Below you will find examples of how we work with the customer to create exactly what they want. 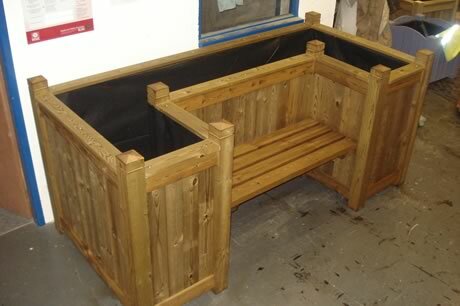 If you would like to enquire about a custom planter please contact us. 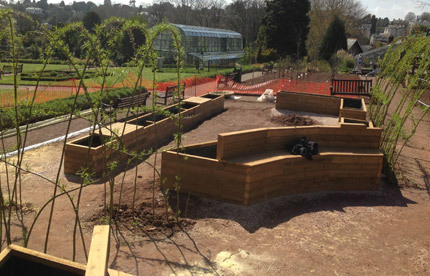 Bespoke orders are also available in contemporary materials including Fibreglass, Aluminium, Corten Steel and Galvanised Steel. 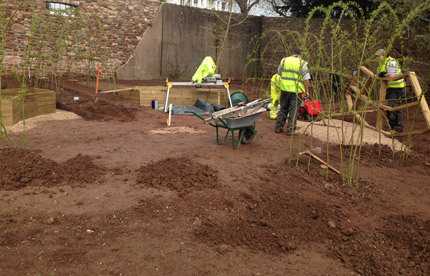 For more info, please click here. 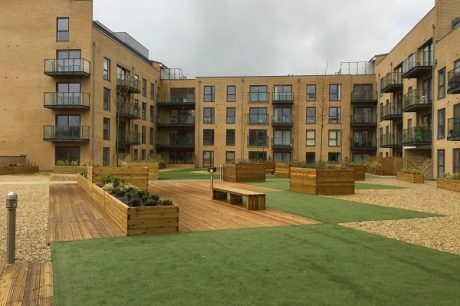 Our Blok planters look stunning at the Bellway Homes building development, used to create a communal area for the residents. 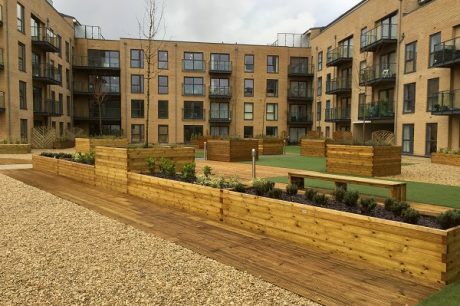 Not only do the planters change the landscape aesthetically, but they are an ideal solution for new developments when underground cabling and drainage prevent the contractors from planting in the ground. 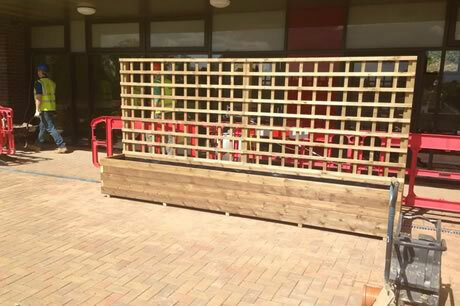 A great focal point, offering great aesthetics as well as practicality and making full use over 25 cubic meters of joinery grade 95 x 45 timber! 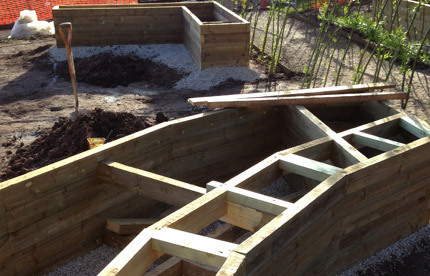 Priory School in Croydon wanted to create a vegetable garden for the school children to learn from so we worked with them to meet their requirements. 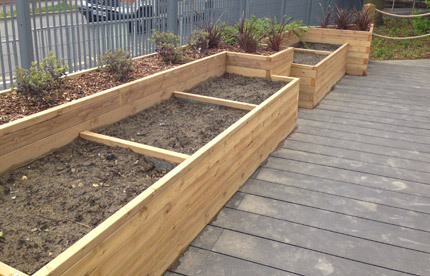 We built large wooden planters and individual vegetable planters for each class so that they could start to grow their own fruit and veg. 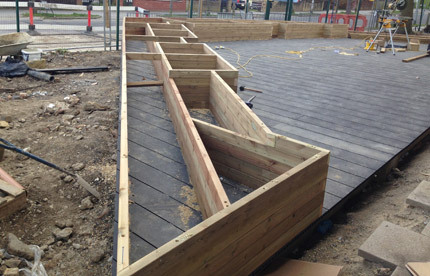 We also constructed a 48 meter wooden container with the purpose to create a barrier between the classrooms and the playground. 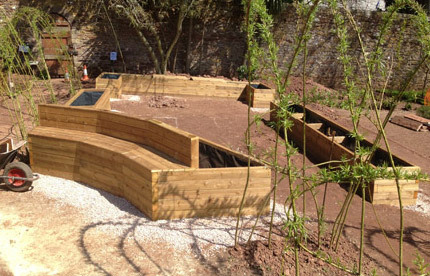 The finished project looks fantastic and the practical design makes it easy for young children to get involved. 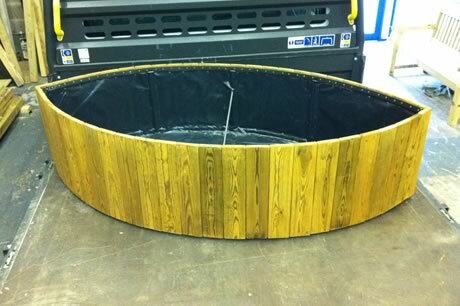 These are custom built commercial planters for a restaurant to create an enclosed dining area. 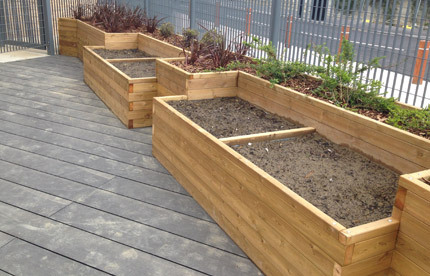 These can be crafted in Oak and Cedar to give an outdoor space a touch of class. 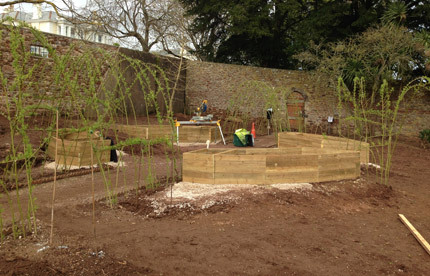 Alison Marshall, the head gardener at Torre Abbey, wanted to create a medieval themed garden so we worked closely with her to construct the design she had planned. 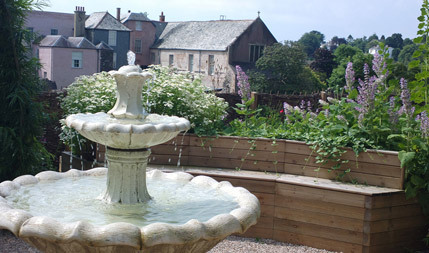 At the centre of the design was a rustic planter integrated with seating and a symmetric seating plan to work with a beautiful water feature that was the focal point of the garden. 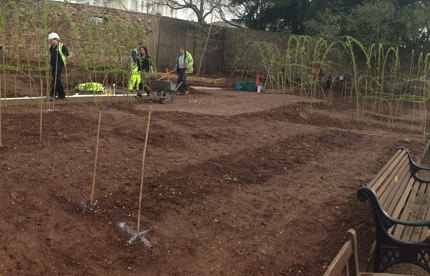 This is one of the team’s favourite projects and we’re pleased to be a part of Torre Abbey’s history. 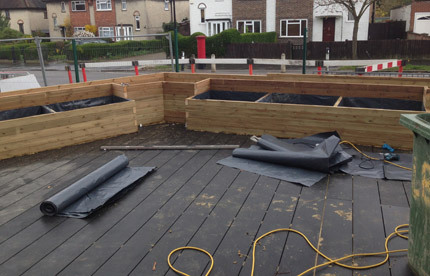 Here we have two custom planters supplied to Downsview Primary in Croydon. 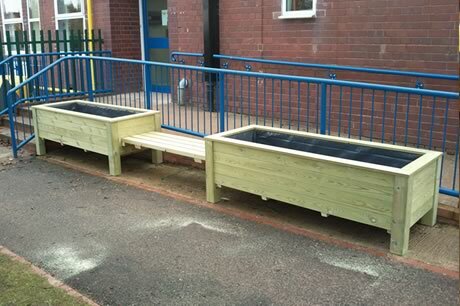 The 1800 x 1800 x 800H Blok planters with trellis and bench to three sides are ideal for school’s and public spaces. 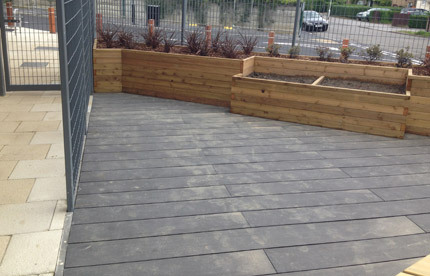 The 3700 x 500 x 500 Blok planter with screening trellis is suitable for climbing plants and creating a shaded walk way. 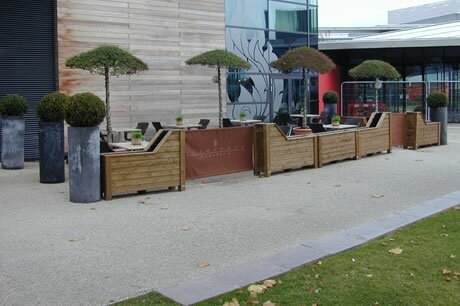 Our bespoke leaf shape is just one of many shapes we can make for your planter. 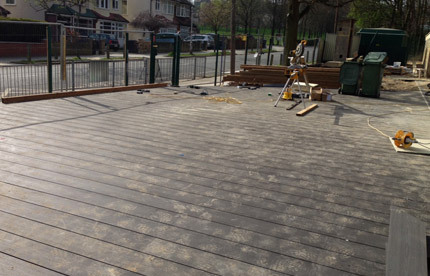 These products are made with a steel frame and clad with the timber of your choice. 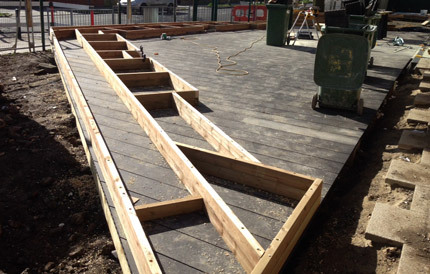 We also line our planters with a thick DPM. 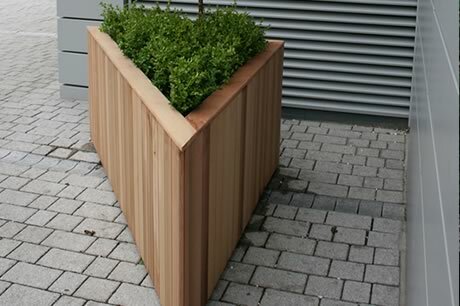 This is one of our western red cedar planters made in a triangular shape. 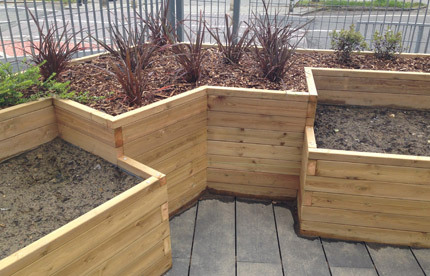 This unique design is perfect for corners and can be made in many different shapes and sizes. 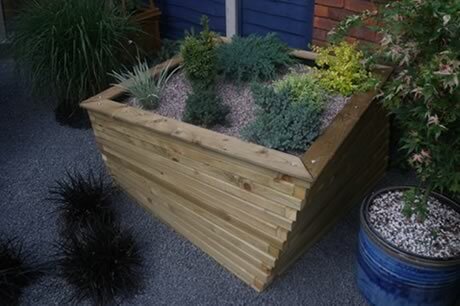 Here is a prime example of how we can customise any of our garden planters. 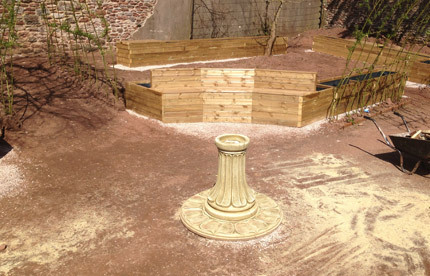 This is a bespoke Versailles planter with an internal bench stained in chestnut brown. 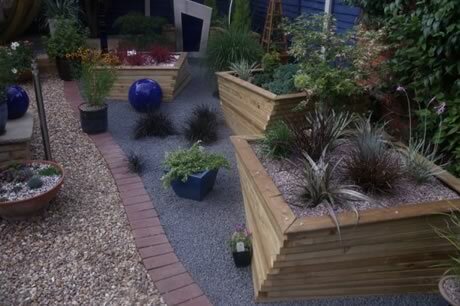 We custom built our Classic timber planters to include a bench, with a design that is secure on a sloped path. 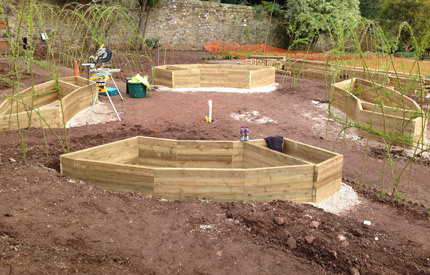 Here we have some of our timber spiral planters in a custom size to meet our clients spec. 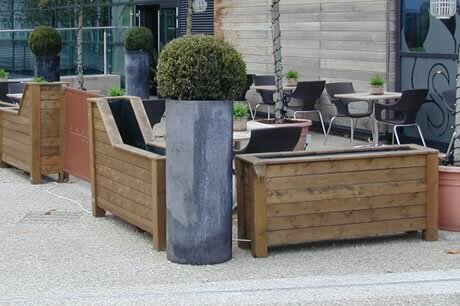 These unusual looking planters are a perfect feature for any garden.